This coin was given to me by Mary Kay, a delightfully Irish colleen who has been involved in environmental and labor justice as long as I have known her. She is married to George, a kind and articulate poet and historian who shares her commitment to making this world a better place. I have found a worthy recipient in Stevensville named Lu. She has been caring for birds and other wildlife for decades and is also compassionately generous to humans, including me. "B" and her family bought a trailer and just found out during heavy snow storms that the roof was caving in. She put a note on the Butte Pay It Forward facebook page on Feb. 28 2019 that she needed moving boxes in a hurry. We loaded about a dozen strong boxes into our vehicle and took them to her along with this beautiful Swallowtail butterfly coin. We think she will hand it off one day to someone for whom she is able to do a random act of kindness. The good deed that goes with this blue Swallowtail coin's first journey is a gift of two books that JB will certainly appreciate. Her gentle kindness is a model for all who know her, so she should truly see herself in the pages of these special books. She does good things for people each day, especially students and elderly people; yet, the joy of her artwork is a kindness to all who see it. 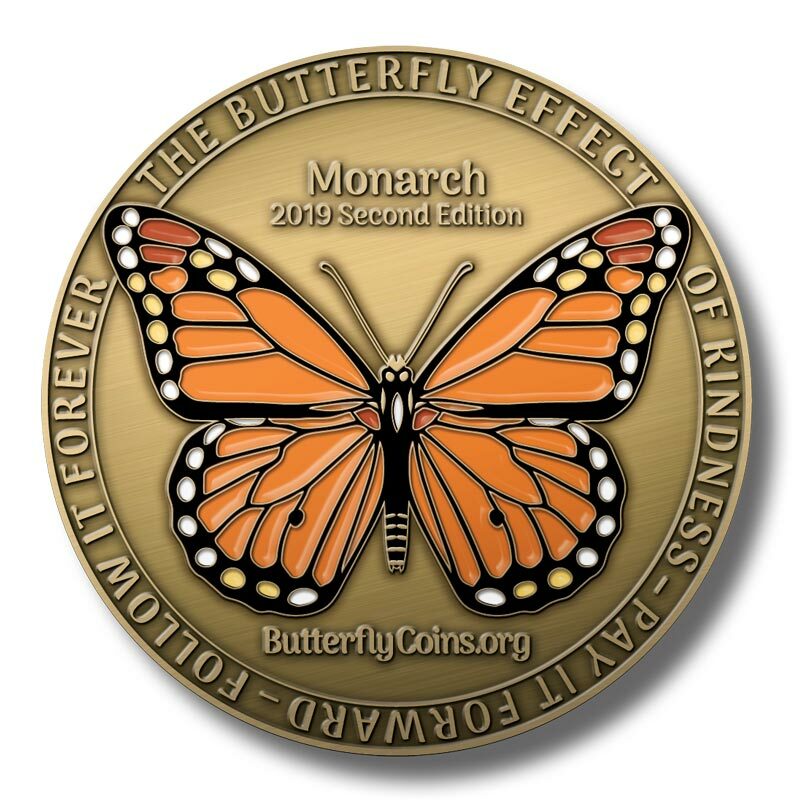 May whoever receives this beautiful butterfly coin from her keep it moving with their own sweet deeds so that it is still causing good things to occur a thousand years from January 2019, "Flying On" into eternity. This coin's first journey was less than ten miles. I offered to get books for FC that she will enjoy, and also gave her this beautiful blue Swallowtail coin. The books and coin all underline my perception of FC as one of the most compassionate people I've ever known. She will see her own kindness in each page of the books and will send more kindness forward when she passes this coin on to its next recipient. "Do Good and Fly On," wee butterfly coin. I lost this coin when I went to dinner on 1/4/19. Perhaps it will turn up and the someone who finds it will delight in their discovery when they read about the coins on this website. As these coins will go forward in perpetuity, may the finder of this blue Swallowtail butterfly enjoy the experience it brings to her or him. "Do Good and Fly On! This Butte-iful blueSwallowtail butterfly coin begins its journey with Father Patrick in January 2019 in Butte MT. This priest's kindness to our veteran friend who is dying of cancer is extraordinary, as he visits him just about every other day. Butte is better for having this caring individual in our community. While he figures out who will receive this coin for him, I will be looking for an opportunity to do a kind deed for Father Patrick. May this coin of auspicious beginnings travel far and bring much good to its recipieints. I apologized to Don A. on 1/24/19 and passed this beautiful blue Swallowtail coin to him. We'd had a misunderstanding some months back which is all OK now. This guy brings a lot of happiness to folks in Butte MT through his creative film endeavors. May he continue to enjoy success in that area, and may his butterfly coin continue on in perpetuity to "Do Good and Fly On!" Cari delights people with, of all things, light. Her "corner" of the world has antique lighting that she has reconditioned so that passersby can enjoy an older building's renaissance. She received a Butte-iful blue Swallowtail butterfly coin on 1/24/19 and the very next day we listened to her radio program on KBMF 102.5 fm LP. Her choices in music are superb, another delight. As both these procclivities are favors to random strangers, she has already paid it forward. May the next person to get this coin enjoy it's purpose: Do Good and Fly On! It's late January 2019 and the Night Watchman is still on the air from midnight till 2:00 a.m. each Thursday night (Friday morning), spinning loving kindness out to folks in Butte, MT USA via KBMF 102.5 fm LP. When he goes to the station tomorrow, he'll find this Butte-iful blue Swallowtail butterfly coin. May he enjoy using it with a random act of kindness or other good deed so this wee winged wonder will fly on forever! When I admired Suzanne's handmade earrings, she gave them to me! Happily, she accepted mine, as well. So to accompany those peace cranes about her ears, comes this beautiful blue Swallowtail butterfly coin for her pocket. As she is constantly giving and doing for others, I expect this wee butterfly will have great fun flitting from Suzanne to another fine person, on and on over the next millennia. Do Good and Fly On! Hey 'Lij! We are so happy to know you. And we are looking forward to going to dinner again soon. Meantime, you have this butterfly coin called a Swallowtail, and you are asked if you would like to give it to someone you do a favor for. Or maybe you give it along with a kind deed you do for a friend. Or maybe you "pay it forward" by giving something to someone you don't even know who needs a kind word or deed. David's butterfly coin comes to him in January 2019 in recognition of his sincere human and scientific respect for life, especially in the Superfund sites of Butte, MT. He's attained the ultimate degrees of knowledge here and the respect that goes with it. But here's a guy who is totally engaged in science and at the same time totally immersed in the human aspects of life. Butterflies trust him. So do humans. His beautiful Swallowtail coin will reach through centuries to carry his caring nature into the next millennium as we all try to "Do Good and Fly On." Good wishes to the folks who receive this coin, as it comes from a man totally full of kindness. This beautiful blue Swallowtail coin was given to Bill M. on 1/22/19. The good deed that went with it is that I am helping with a research project of Bill's. I was glad to give a butterfly coin to Bill because we, who misunderstood each other 25 years ago, have become pretty good friends over the past several years and found we work together quite well. The fun is that what we volunteer to do will benefit others in perpetuity! And it's in that spirit that I am certain Bill's butterfly effect of kindness will carry on and on, perhaps to the next millenium. Go wee butterfly, fly on! An old friend from ~60 years ago, Tom will receive this beautiful blue Swallowtail butterfly coin the week of January 21, 2019. Not too quickly, as it has to fly over the Continental Divide to reach him. With it, I send prayers and wishes for his good health, and just hope any info I was able to provide him was helpful. Have fun with this butterfly, Tom. Do Good & Fly On! Our good friend R, who now holds this pretty Swallowtail coin, could probably give away a dozen a day. That's because he does such nice things so often. He's contributed his excellent skills as a volunteer to help establish the infrastructure for Butte's community radio station, KBMF 102.5 fm LP. And he's a great volunteer DJ there, as well. May his beautiful butterfly do good deeds in perpetuity! This beautiful Swallowtail butterfly coin is now with Lynn. She's done many kind things for me, especially when I was ill, and I hope I will think of new and fun ways to repay her goodness. So, in the case of this butterfly coin, I owe her one! With her caring for this coin, it is sure to delight someone through a random act of kindness or other nice surprise. Hope each who hold this coin in the future will keep it Doing Good and Flying On! The person who now carries this beautiful Swallowtail butterfly coin is one who cares about people so much that she does kind things for most everyone she encounters. She's always smiling and her happiness is contagious. She will easily know just how to pass this coin along. Do Good & Fly On could easily be her motto. A kind therapist lives up the alley; yet, I only see her when we are at gatherings of like-minded folks. Yesterday, she told of her gratis sessions with a patient whose health insurance company denied payment after the fact. I gave her this coin, and promised to do her the favor of finding and sending her the name of the online health journal that publishes stories about outrageous costs and poor behavior of insurance companies. I hope they publish the information she gives them. Given who she is, this beautiful Swallowtail butterfly will surely leave her hands to Do Good & Fly On. Mailed this beautiful blue butterfly from Butte Montana USA to nephew Dan in the Tri-Cities area of Washington on 1/17/19. He can do most anything, and uses his knowledge and skills to help others. So it likely won't be long before it is out of his pocket and into another's along with a random act of kindness. Fly on sweet Swallowtail! Mailed to Maille (Irish = Molly) on January 17, I imagine she will ponder its potential and whether it might really make a difference that causes humans to be kinder to each other. Where this beautiful blue Swallowtail butterfly goes when it leaves her hands will represent goodness, whether in hope or love. Fly on in perpetuity, wee butterfly! Off on migration perhaps, this little blue butterfly will go southeast from Butte, MT to Houston TX and alight on the mailbox of niece Theresa. Thence into her pocket or pocketbook, the sweet Swallowtail will create an itch that says LOOK, look, for a chance to do a random act of kindness. Watching the speedy Houston traffic with a Mom's carefulness, she may have to pass by some worthy potential recipients of a random act of kindness + butterfly coin. But it will come together at the right time and place. And off again, the wee butterfly will do good and fly on into perpetuity! Gentle woman, Barb, whose kindness spreads to and beyond all those who know her, will probably think a bit about who will receive her Swallowtail coin along with one of her lifelong kindnesses. Then, suddenly, it will fly from her hand, and this Swallowtail will rest next in the pocket of... Well, she'll know. Do good and Fly on, wee butterfly! Daniel will receive this coin mid-January 2019 right in the heart of Butte MT -- at his fave radio station, KBMF 102.5 fm LP. A culinary artist whose souffles are light as air, he is a strongman too, able to lift leaden iron tables and chairs. A man of the light and of the heavy, he will surely pass this wee Swallowtail on to someone he respects through his constant and often random acts of kindness! Fly on wee butterfly! The Grand Poobah of Butte will soon have this unsuspecting blue butterfly in his care. As his demeanor and profession both require some sugar, sometimes spice, and always everything nice, plus repairs with with sticks and stones while petting puppy dog bones, he'll likely pass this Swallowtail on to an equally kind person. If such exists. Hope this fluttery flyer goes on in perpetuity from its cocoon on "the Richest Hill." Fly on wee butterfly! Geoff will always have a good jingle in his pocket if he keeps this beautiful blue Swallowtail brass coin there. But I'll bet he sends it off along with a random act of kindness to one of the people he either protects or advocates for. He's such a fine advocate for kind causes, any of us could possibly receive his butterfly coin! Hope the lucky recipient will continue the flight of this winged coin on into perpetuity! Melissa spends her days caring for people in dire circumstances. Her big heart shows she's a great choice to receive this beautiful blue butterfly. Whether she carefully chooses the next person to receive this coin, or attaches it to one of her random acts of kindness, we hope this Swallowtail takes off on a long, long journey of kind deeds. Fly on, wee butterfly! A brass butterfly coin for a silver dollar man. Brian exemplifies the kindness that holds communities together, volunteering in important ways that often only he can do. One of these fine days, one of the recipients of his acts of kindness will also come away with this Swallowtail butterfly coin and will keep it moving among big-hearted people. It will Do Good and Fly On! Don already knows where this Swallowtail coin will go next. A kind neighbor did him a huge favor, and so Don will come up with a kindness to return to that guy along with this coin. And that neighbor will surely "pay it forward" to a new recipient of his goodwill as this butterfly takes off on its magical journey in Butte, Montana USA. Do Good and Fly On, wee butterfly. Steve will initiate the flight from Butte of this butte-iful Swallowtail coin. As a man who emulates the selfless kindness of great teachers, he will have no difficulty choosing which of the recipients of his favors will next carry this coin. In this butterfly's journeys about the Continental Divide, may it always be handed off to a person who will add to its lovely story via these pages. Therese's butterfly coin will have a happy perpetual journey. She touches vulnerable people's lives daily in her profession, and will choose to pass along this Swallowtail and a random act of kindness to someone who is sure to continue this butterfly's flight of goodness. Fly on, we butterfly! Ann's butterfly is a Swallowtail emerging on the mile-high hill of Butte, Montana USA. Ann must decide among many recipients of her kindness which one will receive this traveling inspiration for random acts of kindness. Hope all who receive it will continue its story on these pages. Do good and fly on, wee butterfly! This Swallowtail butterfly coin landed at Hugh's place on 1/16/19. He'll surely choose that one of the nice things he does for others warrants this coin go with the recipient of his random act of kindness. From Butte with love, may it fly on forever! Today, January 16, 2019, Jill received this Swallowtail coin. She has done innumerable kind favors for us, and we have finally been able to do one for her. So she will pay it forward by giving this coin to someone for whom she will soon do a random act of kindness. (She'll likely only hold onto the coin for a few minutes, given the number of lovely deeds she does for others!) What an amazing good friend is Jill. May her butterfly coin fly on forever! This Swallowtail will accompany Rich and his fine music until just the best combination of good deed to be done and recipient come his way. Perhaps he'll create a song in honor of this coin; maybe something like the Bumblebee song, but more like a Butterfly flitter! Do good and fly on! Happy Birthday to Dark (belated)! Hope this coin sets your new year off in a fine way. Thanks for inviting us to the house warming for your new business/abode in beautiful Butte. You'll have no difficulty finding just the right person to pass this kindness coin along to, as you do so many kindnessses every day. Fly on, wee butterfly! This may become the only blue Swallowtail in a country that has a butterfly flag. We wish bon voyage to it and the friend who will now carry it with a good deed to accompany it to its next owner. Should be easy for him who does random acts of kindness wherever he goes. Fly on, wee butterfly! From Butte, Montana USA, this Swallowtail will greet Philip in Dundee, Scotland on a fine sunny day mid-winter (January), 2019. There may even be "roamin' in the gloamin'" for this busy butterfly, as neither dusk nor dark, snow nor rain will cause its brass to tarry on its way, as it causes multiple random acts of kindness across the pond. Fly free, wee butterfly! This Swallowtail said, "I think I'll go far." The bonnie butterfly started it's flight in Butte, Montana USA, and flew across the Atlantic to Dundee, Scotland and into the hands of mk's smart niece Nora. It will be exciting to see where it goes from there. Do good and fly on, sweet Swallowtail. My sister Katie's coin. It was sent to her in the Bitterroot valley of Montana to arrive about January 15, 2019. On a regular schedule each week, Katie volunteers and does kind deeds for folks in that area. So now with this coin, she'll surely wish to choose a RANDOM act to go with this butterfly! Flitter, flitter, fine flyer! It will be fun to see where you go. This coin is a Happy New Year 2019 presence for Tom who lives in the countryside near Stevensville, MT. As a person who is constantly doing favors for people, he will have no difficulty finding a random act of kindness to give someone along with this coin. Fly on, wee butterfly! Ainsley received this coin on 1/13/19 at the gracious housewarming event she and her friend Dark hosted at First and Utah Sts. in Butte, MT. She does random acts of goodness so often that she'll have a hard time knowing when to send her coin along with one. On 1/13/19 mk gave this coin to Mike A. along with a jar of her homemade chili. He loves chili, and she hopes a gift of chili qualifies as a good deed. Mike has had a disappointing diagnosis that said he has a terminal disease. I think it will be fun for Mike to choose which of all his kind deeds will have this coin accompany it. Mike has done many favors for mk and her husband, and I'm sure most people who know him have been recipients of his random acts of love toward his fellow humans. This coin shall have an outstanding journey. 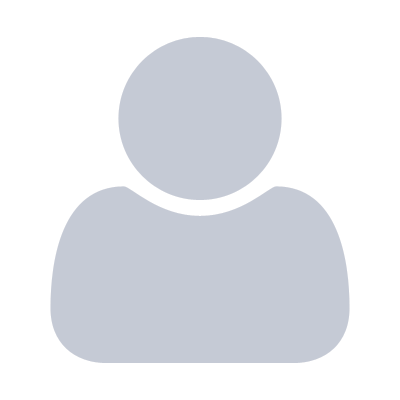 Hope all who encounter it will share its story on this website. Wish I could say I did Travis a favor before giving him this coin. He's a professional carpenter plus++ and is working at our home. He does such good work, and quickly, that he is sure to be a great success in life. I know he does favors for others, including our friend Mike. So I am sure he will have just the right person to hand this coin off to along with one of his kindnesses! Happy flight, wee coin!